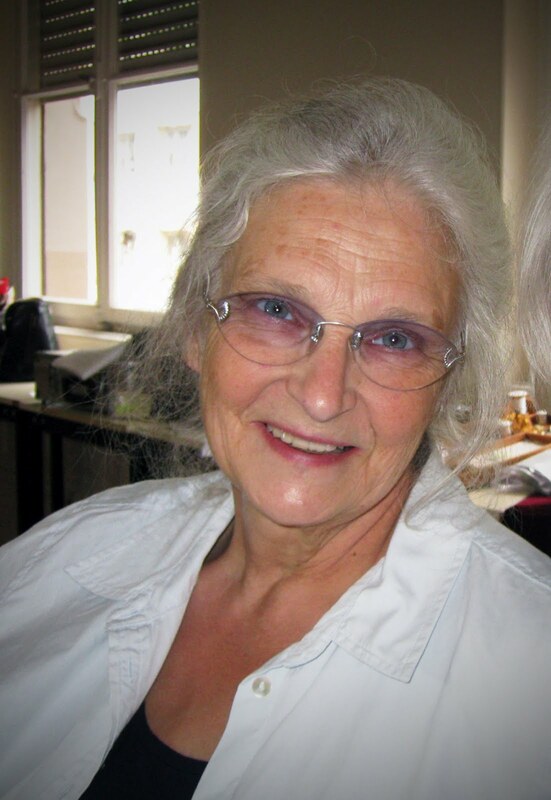 Esther Miller in Ste. Marie-aux-Mines in Alsace France. An example of her own work, Esther brings this intricately and perfectly hand stitched wall quilt to class as inspiration for her students. 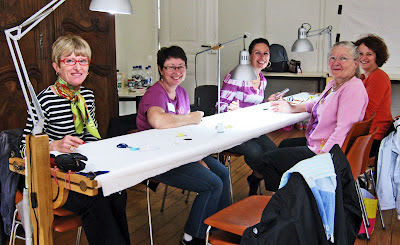 Last week, at the "European Meeting of Patchwork" in Ste. 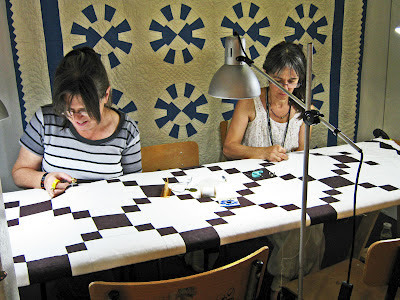 Marie-aux-Mines, in Alsace France, www.patchwork-europe.com, I had the privilege of taking a 2 day workshop with Esther. The Amish quilting method requires a free-standing simple wooden frame upon which the 3 layers of the quilt have been stretched. To accomodate the 18 women in the class, Esther set up 3 quilt frames, with 6 students at each frame. Because the quilt is on a large, unmoveable frame, the quilter sits perpendicular to it, and therefore, must learn to stitch in 4 directions. 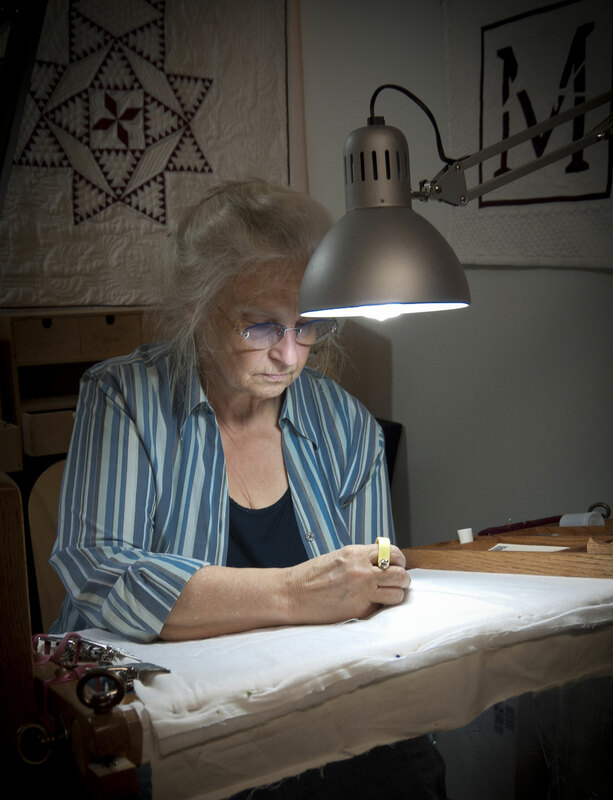 With the aid of several different thimbles, Esther shared her expertise with us and was very thorough and clear in conveying her methods of stitching in all directions. I had the privilege of working together with and getting to know these lovely 5 women for the two days. Clockwise from left to right: Colette, Corinne, Caroline, Valerie and Edith. As you can see from the expressions, we were having a great time. Two of Esther's former students working on a quilt that she has set up in the vendor's mall near her booth. All students are welcome to join the "quilting bee". 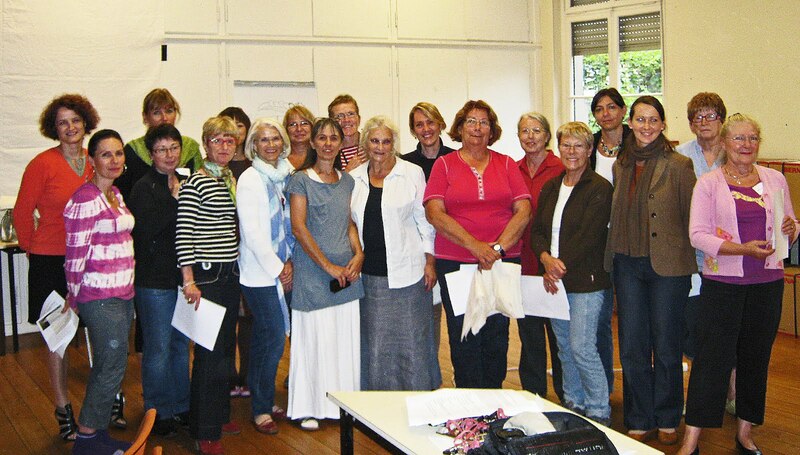 Patricia, on the right, was the French interpretor for our class. 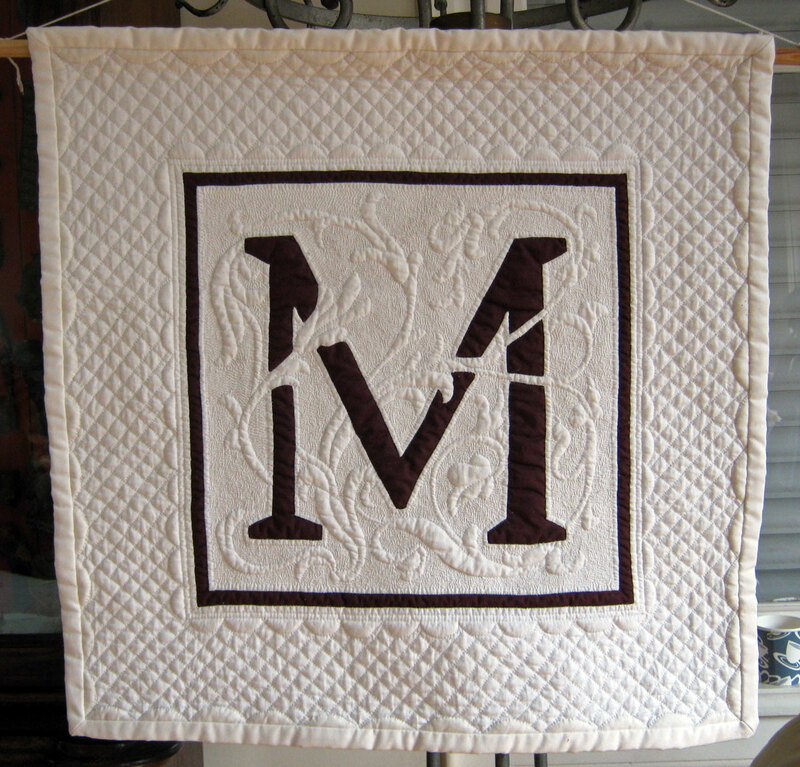 Amish quilting is first and foremost intended to be practical, accurate and efficient. The unintentional benefit from Esther's techniques are small, regular stitches (with enough practice). To achieve these perfect stitches, Esther has her favourite tools, some of which she has had direct influence in developing. From the top clockwise: Esther prefers the "Roxanne" thimble because of the natural curve and deeper grip. 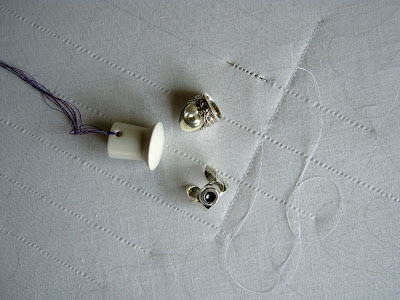 The "thumb thimble designed by Ted Storm" allows quilting away from the body. The final finger tool is a " porcelain needle slide". It is worn on the index finger on the left hand and used under the quilt to gently catch the needle and allow it to slide over its sharp edge, forming a perfect stitch. This porcelain "under" thimble was manufactured to Esther's specifications. All of these tools are available on her website. Tha master quilter at work in her booth at the vendors mall. The quilt directly behind Esther is a replication of an antique quilt that was given to her son and daughter-in-law as a wedding gift. She worked into the wee hours of the night to finish it for our class the next morning. What an incredible piece of artistry! All of the students in the class felt honoured to be the first to see this new work. The whole group of women participating in the 2 day workshop. My own mother was an avid quilter whose quilting methods were very similar to Esther's. To my regret, I did not become serious about quilting until after my mother passed away and therefore, did not avail myself of her skills and talents. Learning from Esther has been an honour and a privilege for me and has reminded me of the importance of cherishing heritage and tradition. Esther will be teaching in Houston in a few weeks; a fabulous opportunity for anyone registered for her class. Check out her website at www.millersquilting.de or at www.kurse.millersquilting.de. Miller's quilting also has a blog "Sew me tender, Sew me sweet", which you can follow at www.blog.quiltbuch.de , as well as an on-line bookstore that sells quilting books in several different languages at www.textilbuchversand.de. Goodness, what amazing talent she possesses. You are indeed very lucky to have been able to learn from her!